Another sad tale from the coast today, this time down south. In 1923, mechanic and motorcycle enthusiast Jim Shipp started a sales and repair business in Wollongong, and in 1949, his son Noel took over as owner. In these early days, dealerships were a huge part of the Shipp motorcycle empire, and Noel sponsored all sorts of club motorbike events and competitions. At some point there was probably a local TV ad featuring the man himself. But as the years wore on, Shipp’s motorcyclery went the way of all enthusiast business ventures in the modern age. The customers dried up, the big dealers moved in, the internet made sourcing parts easier than ever. What was once a cutting edge mecca for all things motorbikes became that crusty, decaying hulk on Keira Street, itself reforged as a cul-de-sac to prevent noisy motorcycle traffic. Enthusiasm becomes eccentricity. Much like Gould’s or Comic Kingdom, when a business reaches the brink of obsolescence, all it can rely on as a drawcard is the individual experience and know-how of its staff. In Noel Shipp’s case, this was a pretty major asset. Even after a spell of ill health and admittance to a nursing home later in life, Noel would still make his way into the shop to tinker around with the bikes brought in solely by enthusiasts. A much-loved and well regarded member of the community, Shipp passed away last September, and the shop has been boarded up ever since. 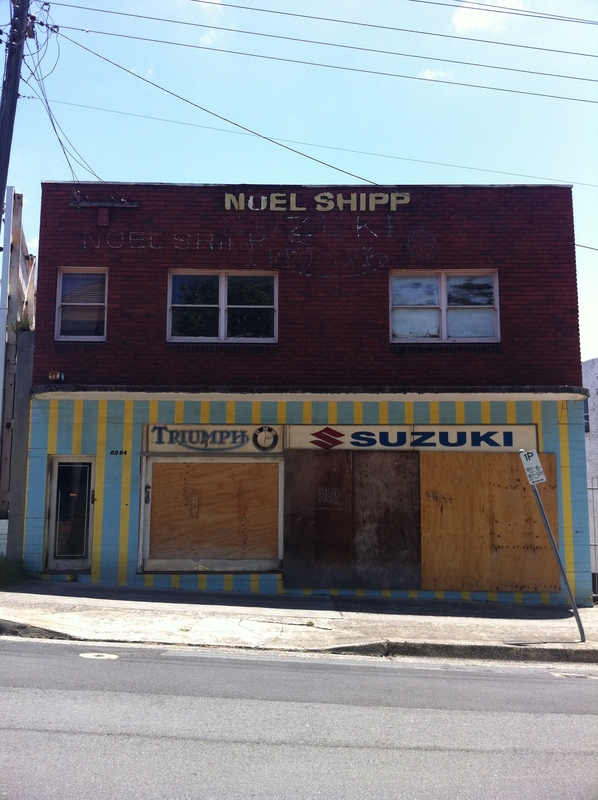 Once the name finally rots away and the motorcycle signs are claimed by souvenir hunters, Noel Shipp will join Jim in the annals of the forgotten, and the shop will just be another brick box in the warehouse that Wollongong has become. UPDATE: Or worse. 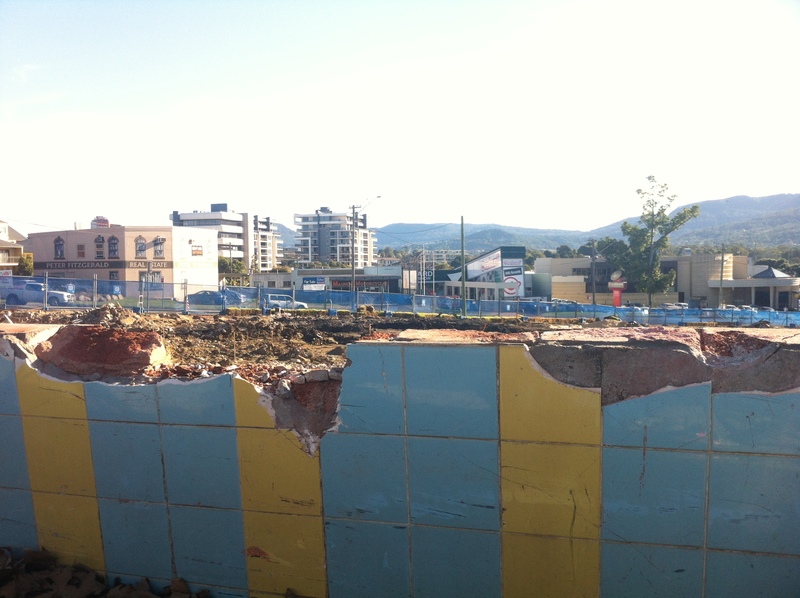 The old Shipp place has met its end, making way for a new attempt to breathe life into this end of the ‘gong. Never one to let anything vintage go to waste, Marrickville’s hipster cred has earned the suburb its fair share of op shops and vintage recyclers. That doesn’t always extend to clothing and furniture, though. U-Turn Recycled Fashion is definitely one of the hippest (does saying that make me painfully unhip? Be honest, I’ve been prepared for that outcome for awhile now.) outlets for vintage clothing Marrickville has to offer, and in a stroke of luck for me, it’s either not shy about or too lazy to disguise the retailer it recycled. 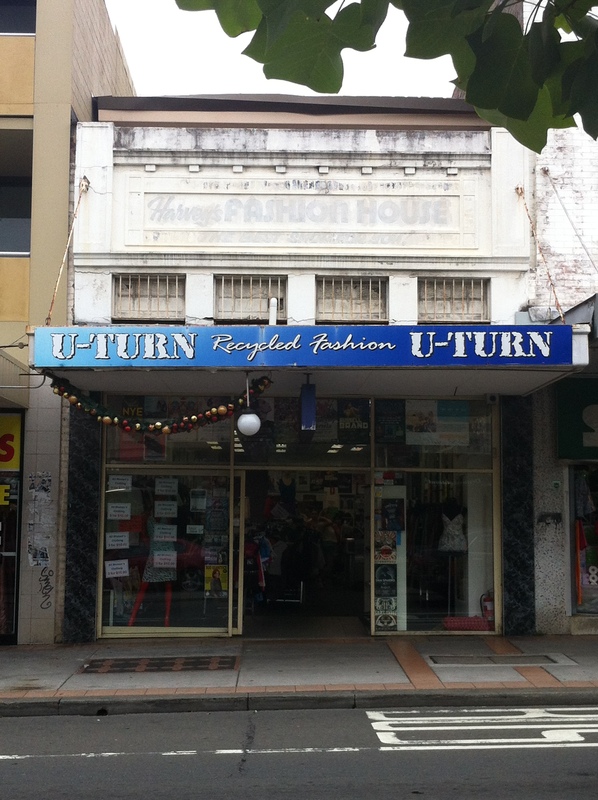 Given the ultra-70s font, there’s a good chance that some fashion that was sold new at Harvey’s Fashion House is now being sold second hand by U-Turn. The very presumptuous Harvey sported this slogan: “The Best Shop For You!” How would you know, Harvey? Do you know me? How do you know I’m not an alcoholic, and the LiquorLand isn’t the best shop for me? Then again, if I were an alcoholic, Harvey recommending his own shop to me is just him lending a helping hand to someone clearly in need and keeping me on the wagon. Thanks, Harvey, I guess I had you all wrong. 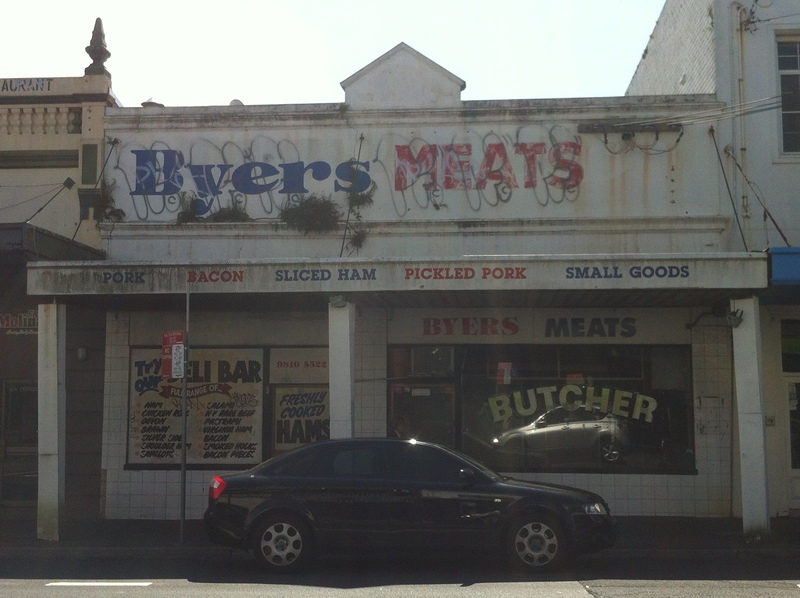 …we can deduce that at some point after 1938, this place finally grew into a full shop. I wonder if U-Turn’s got any 30s hosiery? 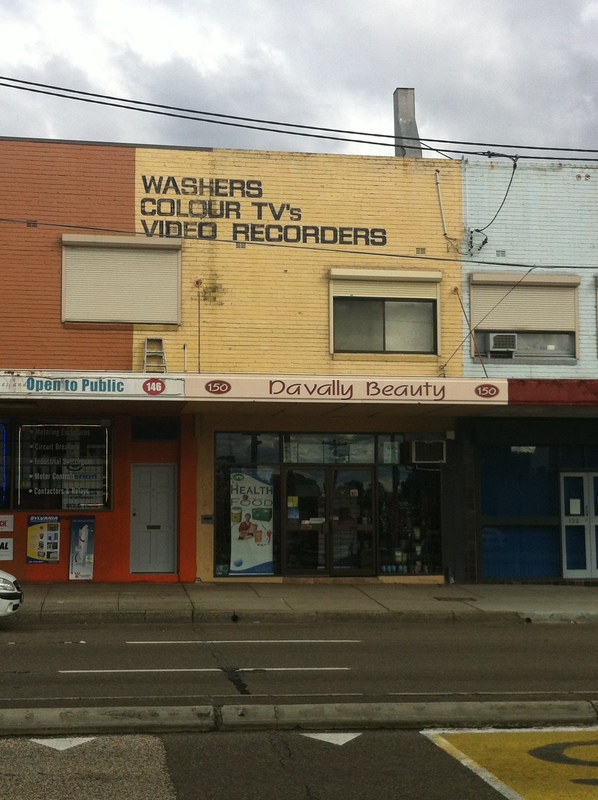 No one street encapsulates the concept of faded glory than Hunter Street, Newcastle, on the NSW Central Coast. Yes that’s right, we’re going on a road trip. I won’t use this post to get up on my soapbox about the advanced state of rigor mortis poor Hunter Street finds itself in; there’s little to say that the street (and locals) doesn’t say itself. I also won’t go into the history of this building beyond what it tells us at the outset…and boy, doesn’t it have a lot to say. The touch-too-dark brickwork, six digit phone numbers and lower case name date the building somewhere in the 60s-70s, and by imagining the Civic Court (or “cic cort” as it’s known these days) in that era it’s possible to see it as a place people actually visited. Laden with bags from David Jones, The Store and Winn’s, you might make a last minute stop at the Civic Court to grab some…mouthguards? 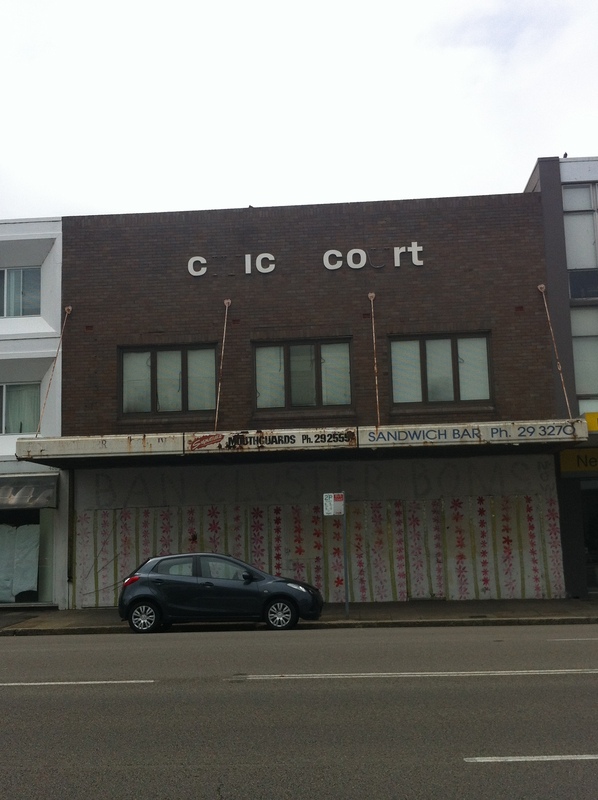 Of the three shops that comprise the now-derelict Civic Court, the first is nigh incomprehensible, the last was a no-name, no-frills sandwich bar, and in the middle was Signature Mouthguards. Think about what that means: there was a time, presumably before cluster boms had cause to be banned, when Hunter Street was so prosperous it could afford to host a mouthguard shop. Shockingly, Signature Mouthguards are still around, and still have the same logo. Anyway, just to prove I’m not the only one who couldn’t work out what that first shop is (and oh how I tried), check out this nifty bit of artwork by Trevor Dickinson.